It envisages creation of Learning Centres at schools and Social Welfare Centres, where unprivileged children can assemble and learn Online. These are mostly either first generation students or living in an environment where most prevalent belief is "आज की अभी देखो, कल की राम जाने". Motivating such children to learn despite their socio-economic-cultural constraints is the biggest challenge. 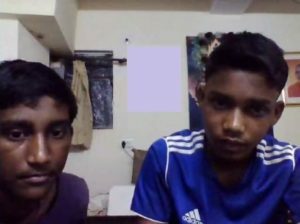 Online Mentoring, is neither a parallel school nor a substitute to existing school. It aims at complementing school system where senior citizens and accomplishes can collectively complement with their sense of Personal Social R esponsibility (PSR) towards Democratization of Education. Democratization is a spiritual notion, and not the least political, and envisages equal, open and accessible opportunity to all without discrimination. Target group of students in 8th to 10th, for this period is most formative in concept building. These students are taken progressively upto 12th. Presently, we target Maths and Science students, It is due to criticality of the subjects and generally prevalent phobia for these, their importance in thought process and career options that they offers. While, students dreaming for a career in Engineering may find it of immediate concern. Nevertheless, students wishing to diversify in other career shall find it an opportunity to build essential traits, which otherwise become extremely difficult to acquire at a later stage. Upcoming Digital India offers a great opportunity to connect passionate persons and teachers to reach students who are deprived of the opportunity to grow through education of education. All that it needs is faith in collective wisdom and effort to bring the change in educational paradigm which individually none can do it. 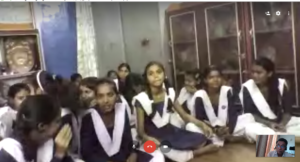 A little of institutional, social and administrative support to ensure availability of requisite internet connectivity and a coordinator who would administer to bridge the learning gap between students and remote mentor, will demonstrate a big impact. Eventually it will turn into capability transfer trans all boundaries. 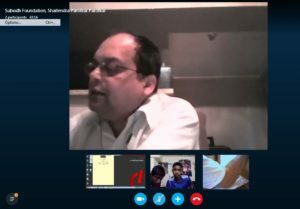 Presently, Interactive Online Mentoring Sessions (IOMS) is being shared Shri Shailendra Parolkar, IIT Kharagpur, Alumnus from Texas, USA, and inland by Prof. SB Dhar, an eminent mathematician, Smt Kumud Bala, an experienced teacher of Chemistry and Dr Subhash Joshi, a Power Engineer. While, Dr Ramesh Chandra, Shri S.N. Khanna and Smt. Shalini Mathur are supporting this initiative at back-end with Chalk-N-Talk. This manual is a free web-resource. It is devised to integrate and correlate concepts, and thus make the subject m atter relevant surrounding of students which they can visualize. It is not a substitute of either reference books nor the text books. In this manual every topic is made contextual and based on illustration in previous chapters and sections. Mentors, would find it useful to customize illustrations to the suit to learning needs of target students. Thus it would make the subject matter both relevant and interesting. Using solved examples and unsolved ones, from references cited therein or anywhere, capability and confidence of students to apply the concepts can be enhanced. Mentors are, invariably postgraduate in their discipline and would find this manual a handy reference. Ambitious students may like to venture into this manual. However, they are advised to read it from beginning and sequentially. They will find that, none of the topics, apparently out-of-course has been integrated in the subject matter and could be pursued without getting baffled. Nevertheless, if they come across any difficulty may approach their teacher or write us through Contact Us. Such students would be encouraged with prompt reciprocation. 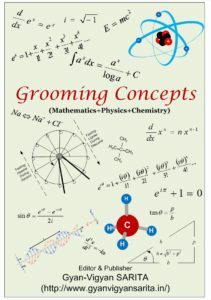 This manual is under development and chapter encompassing knowledge of Mathematics, Physics and Chemistry right from basics upto any qualifying test for students of 12th standard shall be would be uploaded progressively. Concepts of an expert are not like a static foundation of a huge structure; rather it is like blood flowing in a vibrant mind. Concepts lead to the capability of blending of knowledge with questioning of How? and Why? Mentors' Manual has a specific purpose to facilitate transfer of knowledge during teaching. This manual has its own rhythm and pace. Nevertheless learning so as to grow into an expert, each one must have used best of the books available on subject and received guidance of best of the teachers. Author of a book has a limitations to take every concept thread bare from first principle and so also must be the constraint of teacher while mentoring a class with a diversity of inquisitiveness and focus of spectrum of students. As a result, there are instances when an ambitious person has to live with conceptual a discomfort. The only remedy to overcome the discomfort is to continue to visualize the problem in thread bare till it goes to bottom of consciousness and that is an ingenious illustration. 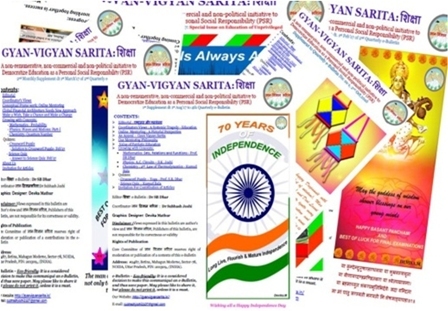 This is a compilation of such illustrations developed by our mentors and are being brought out as articles in our monthly e-Bulletins in Column Growing with Concepts. 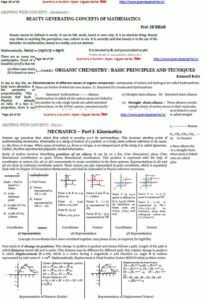 In this column an effort is being made to take one topic on Mathematics, Physics and Chemistry in each e-Bulletin and provide its illustration from First Principle. We invite all experts in these subjects to please mail us their ingenious illustrations and it would be our pleasure to include it in the column. These contributions will be suitably indexed and acknowledged. We hope this repository of ingenious illustrations, as a free educational web resource, will keep growing with time, and would be able to ignite minds of children, particularly unprivileged students, that we target in this initiative, and in general to all who are prepared to look beyond. It provides a set of problems and questions to be solved in a graded and regu lated manner. Howsoever, good a student may be, unless he is tested in respect of depth of knowledge and ability to apply it in problem solving, none can adjudge either his competence or preparedness to face a competition. Competition requires just does not demand competence to solve; it does require accuracy and speed of a composed mind under stressful conditions. These attributes are not acquired in one step. It requires gradual and contiguous practice. It is essential to remember that no test is the last test and, therefore, in every test of excellence a student knows what one knows and that one does not. Therefore, each test requires some time to overcome conceptual glitches before accepting next challenge either at same level or at higher level, this is called contiguous preparation. This level of test has to be regulated based on performance in each previous test. Considering need of testing, re-testing, and level testing students would be supplied with graded tests. 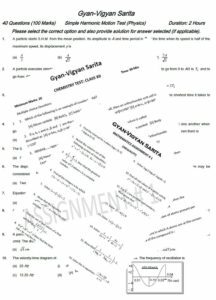 Only after evaluation of answer sheet with solutions, submitted by student, next set of questions would be supplied to student. This facility would be available to students registered at one of the Learning Centers of Online Mentoring operated by Gyan Vigyan Sarita or its associate. This facility is also extended free and to encourage students to accept challenge tests and re-tests, and thereby discourage generally prevalent tendency among student to compile literature and question banks. This is a place w here students can address doubts, questions, problems to either mentors or student colleagues. Resolution of all this shall be monitored. Students solving problems raised by other students shall be highlighted. It also provides them a platform to place their creative work in the form of text, graphics, audio, and video. Any passionate effort unless shared with co-passionate and like minded persons it is bound to remain very much personalized and localized. This mission has a vision beyond self to translate a philosophy into action that propagates importance and value of education as a backbone of social well-being and coexistence . This mission needs to be visible for elite and accomplished person to ponder upon it and make a difference, in their own way by moderating, correcting, deleting and/or changing. This will help to perpetuates the cause as a spirit, as an open philosophy. Accordingly, we are publishing a Quarterly e-Bulletin with supplement in each intervening month. Making this publication as e-Bulletin is a considered decision, to walk-the talk by conserving paper and make it most economical to be able to sustain in a mission which operates on Zero-Fund-Zero-Asset (ZFZAl basis and in a non-remunerative, non-commercial and non-political manner to democratize education as a personal social responsibility (PSR). Every initiative has beginning in some circumstances, more passionate the initiative is, more compelling are circumstances making it a philosophical discourse. This initiative is manned by persons who as a student and professional are groomed to translate philosophies, concepts and ideas into a reality which is feasible, economical and sustainable. Disseminating the desperation Desperation, to do beyond individual capacity, to the persons who can make a difference, needed a different avenue. Accordingly, blogs on our thought process and steps to implement them are being posted from time-to-time so that like-minded persons could come forward to collectively complement either for the cause or change the course, to the extent they can, to make it more purposeful.